One of Our Fifty is Found! A-ha! moments from New Mexico Magazine readers. “One of Our 50 Is Missing” is one of the most popular and beloved pages of the magazine. But we’ve noticed something in our “Mailbag” letters, Facebook page, and Twitter feed: how powerfully our community connects with New Mexico not only as an endearing underdog, but as being straight-up awesome. They love it. They pine after it. They celebrate it. They find it, and it finds them—whether they were born here or visited—and, often, never left. That sentiment inspired the theme of this issue, and to keep it rolling, we’re launching this new monthly department to keep “Missing” company: “One of Our 50 Is Found!” Please share your own stories. For a limited time, we’ll be rewarding “Found!” contributors with a free hat emblazoned with the slogan “new mexico—not really new and not really mexico.” Send your anecdotes (with name and mailing address) to fifty@nmmagazine.com. And keep the “Missing” items coming, too. Thanks! I was born in Denver, and grew up in Los Angeles. However, when I was growing up, I always knew that my family roots were deep in northern New Mexico. In fact, my parents met in Denver and married, only to later find out that their fathers were childhood friends from the same town near Las Vegas! Both sides of my family have Native (Pueblo) and Spanish ancestry. My Grandma Medina (maiden name Garcia) spoke 16th-century Spanish, while her husband, my Grampo Medina, spoke Old Spanish, Tewa, and English. My grandfather on my mother’s side, Grampo Gallegos, served with the 200th Coast Artillery and survived the Bataan Death March in World War II. Every year, my father would travel to New Mexico for a week to drive my Grampo Medina to Santa Fe and surrounding areas to visit with family. When I was 20 years old, he asked if I could step in for him. I of course said yes, and shortly after arriving in New Mexico, I realized who I was and where I belonged. You see, prior to this trip, growing up in East Los Angeles, we always knew we were a little different from the predominantly Mexican-American families that we knew in our neighborhood. We looked a little different, our food was different, and we spoke differently. In New Mexico, I was amazed how much all of the women looked and acted like the women in my family. Spending that time with my Grampo and meeting my family in Santa Fe opened my eyes to the beauty of New Mexico, the beauty of my culture, and the beauty and strength of all New Mexican people. This trip turned out to be the best gift I could have ever received. I got to know my grandfather on a deeper level, I got to know my extended family, and after I had children, they grew up going to New Mexico every year (sometimes twice a year). I now own a casita in Corrales, and although two of my children are grown and making their own ways in the world, they still want to be with their parents in New Mexico as often as possible. I love New Mexico, and I appreciate the respect your magazine pays to her. Attached is a picture from our most recent trip, taken in Chimayó, across from Juan Medina Road. My A-ha! moment came in the summer of 1966, as I stood on the peak of the Tooth of Time, at Philmont Scout Ranch, at sunset. I was 14 years old, but I knew this was where I wanted to be. It took 44 more years for me to move here permanently, but now I am hiking the Sangre de Cristos again. I had never been to New Mexico before, but had always wanted to go to Santa Fe. My dad offered to take me on a trip for my 40th birthday, so I chose New Mexico. 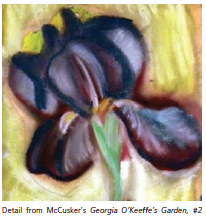 I am an artist, and before the trip, I became very interested in Georgia O’Keeffe. While doing some research, I discovered that Ghost Ranch was offering its first-ever “Art Session” at Ms. O’Keeffe’s Abiquiú house. The timing was amazing. This session just happened to be scheduled during the five days we were in the area. This experience changed my life. I feel that Ms. O’Keeffe and I connected with each other’s spirits while I was there. She has been with me ever since. It confirmed my identity as an artist, and my destiny. I refer to New Mexico as my true love. The land spoke to me in such a strong voice that I now know I need to live there when the timing is right. I hope that day comes soon.